Two sided marker. 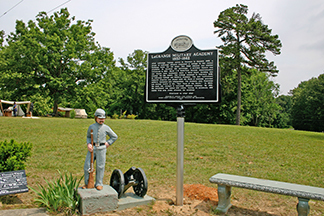 Sponsored by LaGrange Living Historical Assn., Colbert County Historical Landmarks Foundation, Benefactors and the Lawrence W. McGregor Family. Erected in 2012. In the early 1820s, wealthy land owners in the Leighton, Alabama, area established a village on the crest of the mountain to the southwest of this site. This community eventually had about 400 inhabitants and became known as LaGrange. In the 1820s, the Tennessee Conference of the Methodist Episcopal Church solicited proposals for a site and contributions for a college in the Southeast. 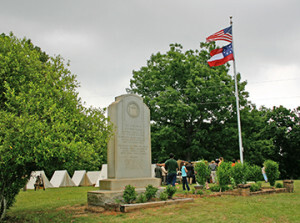 The citizens around LaGrange offered a site and subscription of $10,000. On December 4, 1828, the Methodist Church accepted the LaGrange proposition. Later that month, the Mississippi Conference joined in the efforts to establish a college. Representatives from the two conferences met at LaGrange on January 10, 1829, and selected a site for the college. 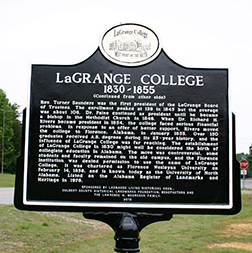 On January 11, 1830, “La Grange College” opened with an enrollment of 70 students. Eight days later the college became the first state chartered college in Alabama. Rev. Robert Paine was the president (1830-1846). Rev. Turner Saunders was the first president of the LaGrange Board of Trustees. The enrollment peaked at 139 in 1845 but the average was about 106. Dr. Paine continued as president until he became a bishop in the Methodist Church in 1846. When Dr. Richard H. Rivers became president in 1854, the college faced serious financial problems. In response to an offer of better support, Rivers moved the college to Florence, Alabama, in January 1855. Over 150 graduates received A.B. 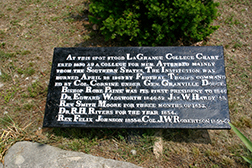 degrees during its 25-year history, and the influence of LaGrange College was far reaching. 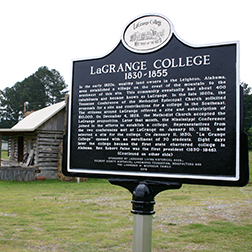 The establishment of LaGrange College in 1830 might well be considered the birth of collegiate education in Alabama. the move was controversial, some students and faculty remained on the old campus, and the Florence institution was denied permission to use the name of LaGrange College. It was chartered as Florence Wesleyan University on February 14, 1856, and is known today as the University of North Alabama. Listed on the Alabama Register of Landmarks and Heritage in 1976. After LaGrange College moved to Florence in January 1855, a group of LaGrange citizens organized a college in the vacant buildings under the old name. Rev. Felix Johnson was elected president. To increase the patronage, a military feature was introduced in 1857. Major J.W. Robertson became superintendent and classes were suspended while a third major building was erected for the cadets. The college reopened in February 1858, as LaGrange College and Military Academy. The new institution’s financial situation was dismal until the State of Alabama provided military equipment and scholarships. The Academy soon flourished and became known as the “West Point of the South.” In 1860, the name was changed to LaGrange Military Academy. By 1861, the enrollment was almost 200 cadets. During its existence, 259 cadets from nine states attended the Academy. At this spot stood LaGrange College Chartered 1830 as a college for men. Attended mainly from the Southern State, the Institution was burned April28, 1863 by Federal troops commanded by Col. Cornine under Gen. Granville Dodge. Bishop Robt. Paine was its first president to 1846. Dr. Edward Wadsworth 1846-52. Jas W. Hardy ’53. Rev. Smith Moore for three months of 1853. Dr. R. H. River for the year 1854. Rev. Felix Johnson 1855-8. Col. J. W. Rovertson 1858-62. Erected April 1950 by act of Legislature of Alabama 1945. Paul Coburn, Rep. This is the site of LaGrange College chartered in 1830 by act of the Legislature of Alabama. An institution of high order for men attended chiefly by students for the Southern States. The college was burned April 28, 1863 by federal cavalry commanded by Colonel Florence M. Cornyn under General Granville Dodge.